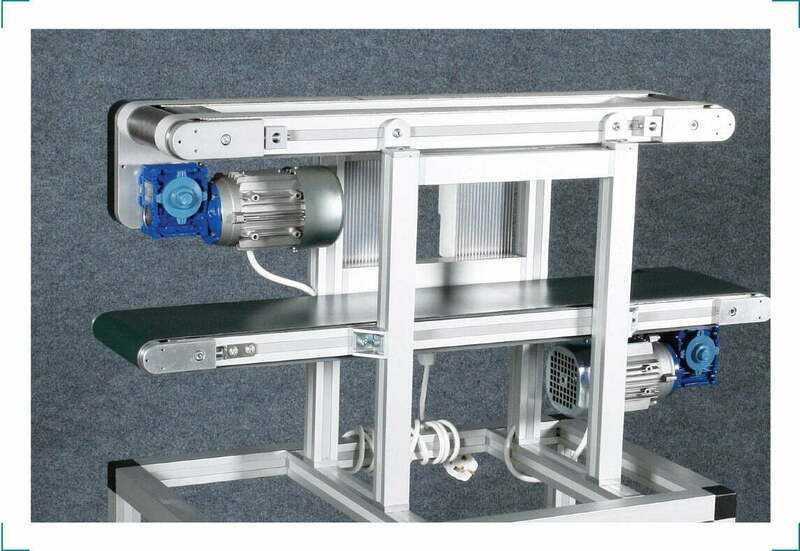 We provide many different varieties of conveyors which are suitable for light, medium, and heavy duty applications. They can be integrated with fully automatic systems running through different production cells or designed as one off conveyor systems specific to your environment or manufacturing process. We can offer you Flat belt, Twin Track, Modular, and Inclined conveyors each of which can be customised to suit your specific needs. We can advise on aspects like belt material, frame design and motor speed. We simply match the right parts with your needs. Our most popular type of conveyor is the belt conveyor which is available in widths between 40mm and 1200mm, and with lengths dependent on your requirements. You can choose from either a direct or indirect drive option with standard motor sizes of .09kw, .018kw and .25kw. The gearbox ratio can be specified by you or we can provide this once the speed of the system is specified. Our frames can be requested at fixed height or adjustable with product guides which can be fixed or adjustable if directional change or movement of the product is required. With so many variables involved in creating the perfect conveyor for our clients, it is always a good idea to speak with one of our design engineers. To discuss your next project with us please contact us here. We coat all side plates, drive plates and tensioners with a clear anodised finish to prevent deterioration, making our conveyors suitable for cleanroom and medical lab environments. We pride ourselves on the highest standards of safety and quality here at Quantum 3 and provide full documentation for our conveyors regarding machinery directives and CE marking on turnkey solutions. ‘The Quantum 3 product stands out from the competition in terms of quality, mechanics and flexibility. Want to speak to someone about your Conveyors?